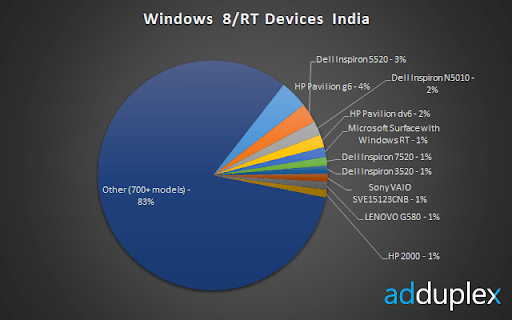 It’s time for the January issue of Windows 8/RT device stats report. Last time we’ve covered the basic stats for all of the devices around the world. 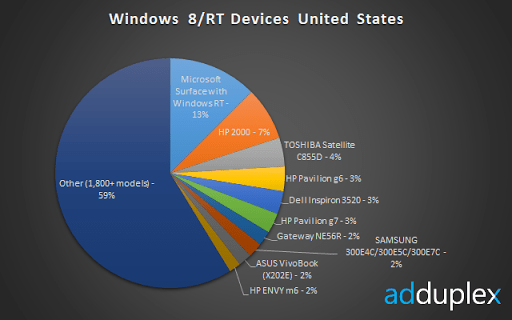 This time we will follow the trend started with our latest Windows Phone report and slice the data geographically as well as look at the Windows RT devices separately. The report is based on data collected by 112 Windows Store apps running AdDuplex ad SDK over the course of one day of January 14th, 2013. We’ve made reasonable attempts to aggregate data for different spelling, minor modifications (color options, etc.) of the same model and/or manufacturer, but there’s no guarantee some of the variations didn’t slip through. Special note regarding Windows RT stats: we were unable to identify Lenovo IdeaPad Yoga 11 in our logs by the time of this writing (either by model name or model number) therefore it wasn’t included in the results. This means that either no one is using the device (unlikely) or we were unable to discover the model name it is reported under (most likely). Update (1/17/2013): We finally managed to identify Lenovo Yoga 11 as Lenovo VenusTZ and its share is even lower than that of Samsung Ativ Tab, so it doesn’t affect the reported stats in any substantial way. The situation didn’t change much since last month. You can see that Surface has gained more than 1% of the share likely thanks to wider availability. Other than that the top 10 is still mostly dominated by the cheap laptop models. One notable touch-enabled exception is ASUS VivoBook. Another thing worth mentioning is that we’ve seen more than 7,400 different device models running Windows 8 this month, compared to a little over 5 thousand a month ago. On the Windows RT side it’s clear that Surface dominates. 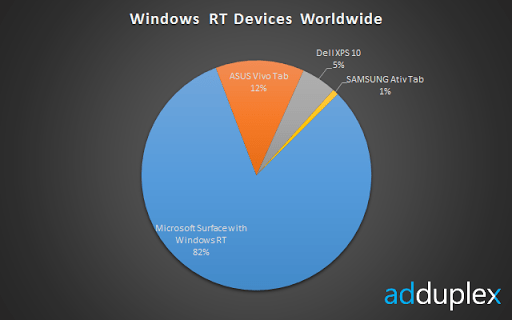 That said ASUS VivoTab has claimed respectable 12%. 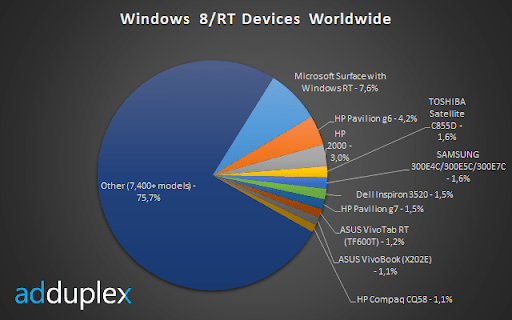 Looking at the Windows 8 vs. Windows RT spread we find the full featured OS on 10x more machines than its new all-Metro sibling. 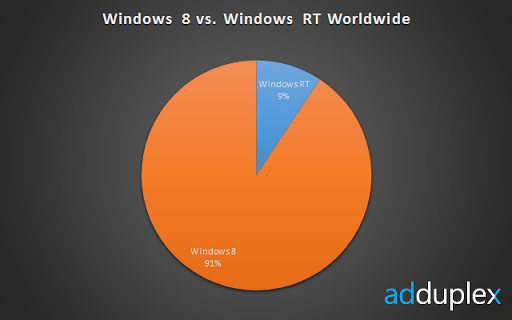 It’s worth noting that our numbers are most likely skewed in favor of RT since our ads run in Windows Store apps only. 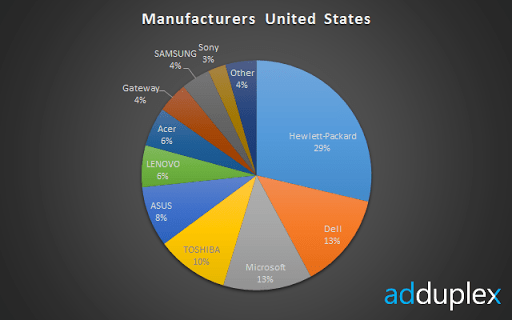 Speaking about manufacturers Hewlett-Packard maintains its lead with ASUS moving up by 2 spots to claim number 2. The situation is quite different from what we see on Windows Phone were several countries control a similar portion of the market. That said it was remarkably similar on Windows Phone just a year ago. 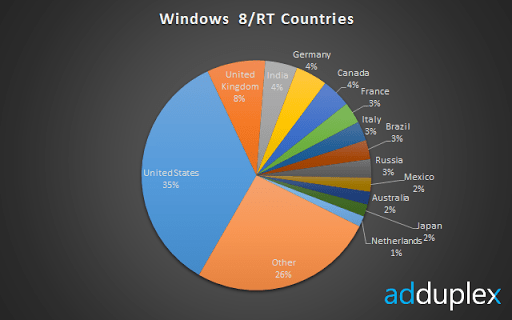 US accounts for 35% of devices running Windows 8/RT, followed by UK (8%), India, Germany and Canada (4%). An interesting tidbit is that China (number 1-2 country on WP) is only at number 55. This could be either due to the Great Chinese Firewall or maybe most of Windows 8 versions in use there aren’t genuine and can’t access Window Store(?). There’s always an explanation that none of the 112 apps on our network are of any interest to Chinese users specifically, but it seems highly improbable. 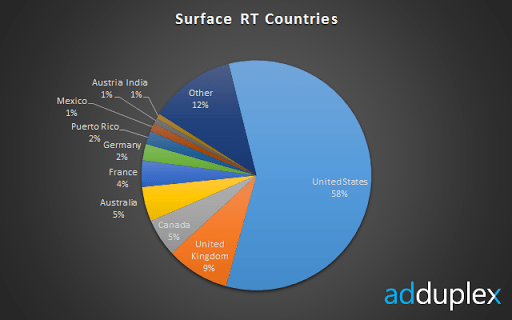 As for geographic usage of Microsoft Surface with Windows RT there are no big surprises except for Puerto Rico claiming a spot in top 10. Overall we’ve seen people using Surface in 115 countries. It would be interesting to see how many countries were represented at the Build conference and see if there’s any correlation. Surface is no.1 in US with the rest of the pack resembling the worldwide spread. 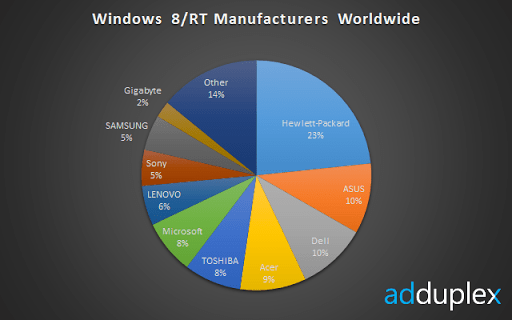 HP is in the lead too, but ASUS is only at #5 in US and Microsoft is as high as #3 though. 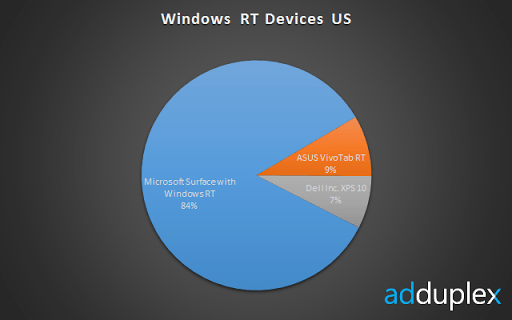 Surface is even more dominant in the Windows RT segment and, as was previously announced, Samsung scrapped plans to release Ativ Tab in US so, however insignificant its share was in the world, it isn’t present in the US at all. 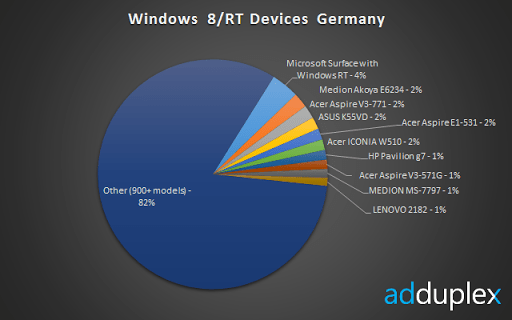 Surface maintains a small lead in Germany with a couple of Medion (likely a local brand) notebooks in the top 10. We also see more Acer than we’ve seen before and Acer ICONIA W510 (which is an Atom based tablet/laptop) giving Surface a run for its money. 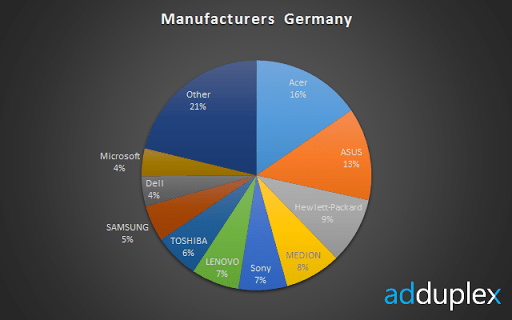 It’s no surprise to find Acer at the top of the manufacturer list in Germany, with global leader – HP, settling for the 3rd place. 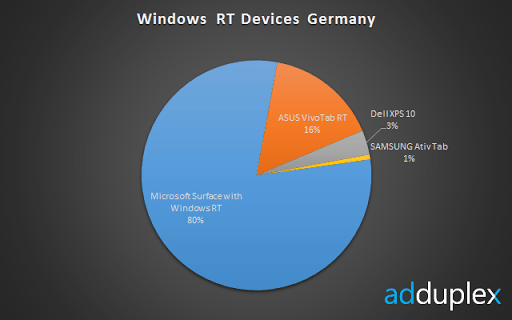 German Windows RT situation is similar to what we’ve seen globally. Moving further east to India we finally find a market where Surface is not the most popular device (#5). Other than that the top 10 is yet again populated with inexpensive laptops from familiar brands. 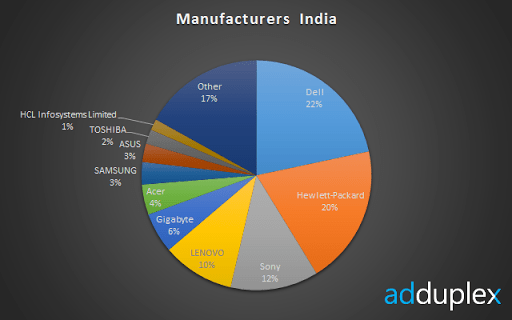 Dell holds a slight edge over HP in India with Sony at number 3. AdDuplex is the largest cross-promotion network for Windows Phone and Windows Store apps empowering developers to promote their apps for free by helping each other. Established in January 2011 and headquartered in Vilnius, Lithuania, AdDuplex is used by more than 2,000 apps worldwide.